A large selection of toys, food, treats, cages and accessories for your Amazon parrots from all the major brands. Need something for your Amazon parrot? In our store you will find everything for your pet Amazon Parrot. From healthy food & treats, to toys, accessories and cages to promote a healthy and active lifestyle. 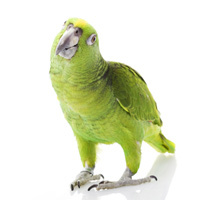 Looking to find everything you need for your Amazon Parrot? From toys, supplements, treats, and more, you can find it right here. Starting with what you feed your Amazon Parrot is extremely important. Whether it be an Orange Wing, Yellow Crowned, or Blue fronted Amazon, you’ll find we offer a massive selection of vet recommended foods, complete foods, pelleted diets, and high-quality seeds. We also offer healthy treats, perfect for rewarding during training, during playtime, or for use with foraging toys. When it comes to supplementing your Amazon Parrot’s diet, we’ve also got excellent choices of supplements, ensuring your bird lives a long and healthy life. If you have young Parrots just starting life or breeding pairs, we also offer a great selection of breeding and hand rearing food. Along with an impeccable selection of foods, we have all the mental stimulating toys, swings, and stands your Amazon Parrot will love. Amazon Parrots love challenging toys, so providing both reusable and chewable toys, musical toys, and climbing toys are perfect to teach your Parrot new tricks. Not only is mental stimulation crucial, but providing ‘out of cage time’ is just as important. When your Amazon needs to spend time in their cage, ensure that they have the largest cage possible. Remember, not only will the cage house your Amazon Parrot, but it will house all their toys, swings, and ladders! If you’re having a hard time choosing a cage, consider cages such as; travel cages, gym cages, or open top cages. When they’re out of their cage, invest in a stand. Determine what kind of stand you’re looking for like; tabletop stands, Java Tree stands, etc. If you’re looking for further spoil your Amazon Parrot, consider other accessories like, special UV bird lights, harnesses, and cage cleaning supplies that will all further benefit your Amazon.